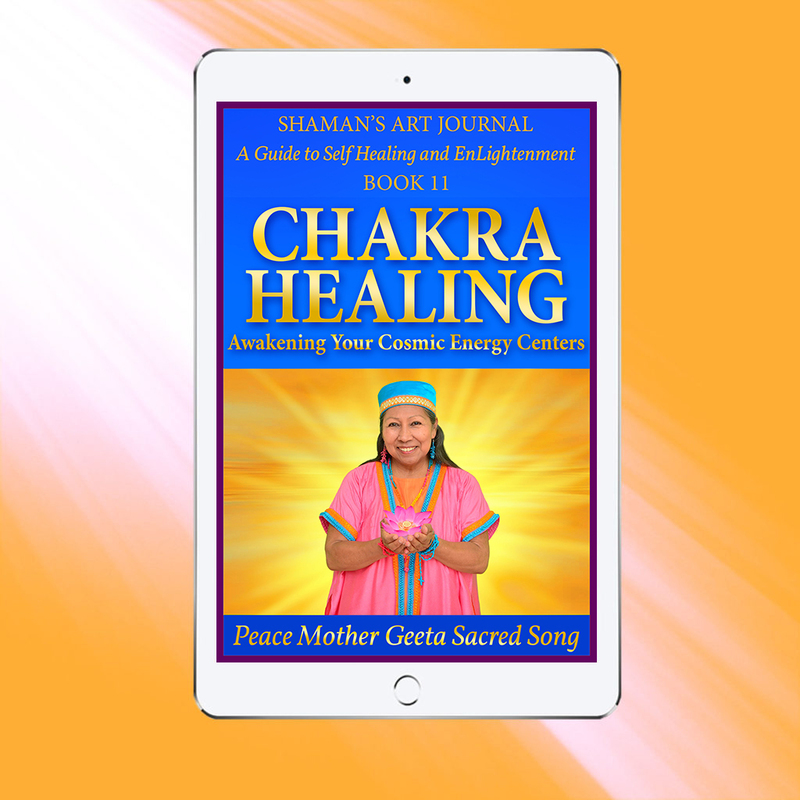 In Chakra Healing: Awakening Your Cosmic Energy Centers, Peace Mother imparts Sacred Wisdom on the many ways you can nourish and heal your your Sacred Energy Centers. Conscious care for your chakras is essential for creating a Balanced, Harmonious, Healthy, Happy Life and Peace Mother provides you essential, yet easy-to- apply Sacred Tools and Training for cultivating thriving chakras. Along with uplifting Shamanic Teachings, Sacred Mantras and meditation-contemplation practices, a beautiful Chakra Healing Light Activation painting is included. Great Spirit channeled this Sacred Artwork through Peace Mother to activate the Light within every cell of your being. Spending time in the company of Peace Mother’s Light Activation paintings accelerates your spiritual expansion so you can experience greater Awareness, Spiritual Knowledge and Self Love. To deepen your healing processes, Peace Mother also reveals the various emotional, physical and spiritual aspects of the major and minor chakras of the body, such as the 7 main chakras and the chakras located in your hands and feet. Holy Mother also imparts Teachings on your nadis, the energy channels that support your physical and Spiritual Essence by carrying Light and Life Force to each chakra, organs and physical function. Peace Mother’s illuminating Teachings also describe Kundalini energy, the Cosmic Energy within you that must stir, arise and flow upwards to elevate your Soul-frequency and consciousness to the highest level. As a Shaktipat Master, She divulges Sacred Teachings on the role of Grace in activating the full potential of your chakras, and how to safely raise your Kundalini Energy so It may purify and heal your chakras. With the ample exercises She provides, you will be able to increase the health and Divine Power of your chakras to benefit all areas of your Life. By working with the Chakra Healing Sacred Artwork and Teachings, you quicken your vibration, igniting a powerful flow of healing energy that brings stability and Divine Peace to your chakras. Through connecting with these Teachings, you can experience infusions of Golden Energy that ignite profound transformations in your mind, body and Soul. As a Master of Light, Peace Mother’s instruction on working with your chakras and Kundalini is rare and invaluable. With each Enlightening Insight bestowed by Peace Mother, you can approach your Life with greater precision and confidence in your ability to heal your chakras, consciously create radiant realities, and experience your Divine, Creative, Inspired Self.